This recipe was inspired by a new food to hit my kitchen, that I’ve never really used or cooked with before: poppy seeds! 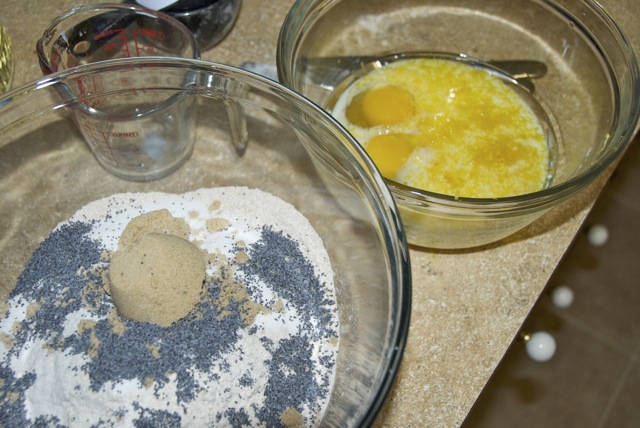 More interesting than the recipe, though, is how these poppy seeds ended up in my kitchen. Well, something kinda cool happened recently. I started this blog to keep in touch with our ever expanding network of family and friends across the country and beyond. I never really had intentions of getting anything out of it, other than the satisfaction of knowing a few people cared enough about our lives to keep up with it. After I wrote about the McCormick cookbook my Mom sent me, she forwarded the link to her McCormick contact at work. 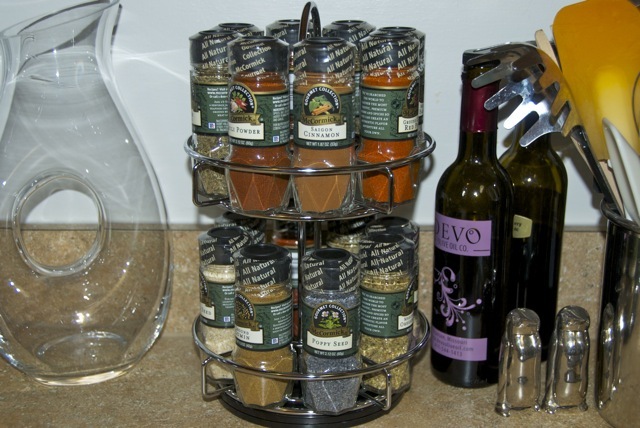 I’m not sure if he was impressed with the blog, or horrified by my Island Spice paprika, but he asked my Mom for my address and a few days later an awesome spice rack appeared at my doorstep! 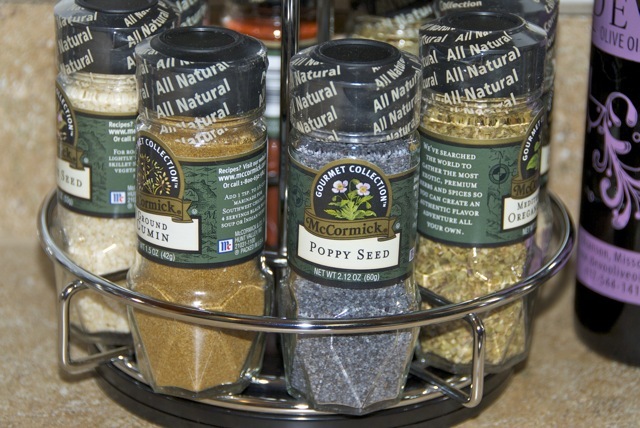 YOU might not get all that excited over brand new and organized spices… but I certainly do! I was particularly intrigued by the shaker of poppy seeds. I’ve eaten them, of course, but never bought or used them. 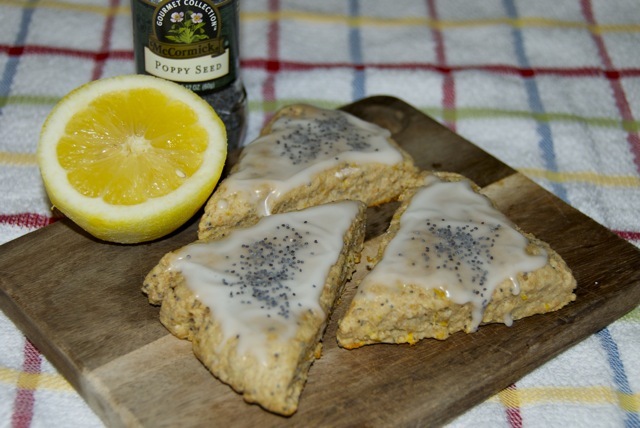 I think everyone thinks of 3 things and 3 things only when it comes to poppy seeds… lemon or orange muffins, salad dressing, and maybe some crackers. 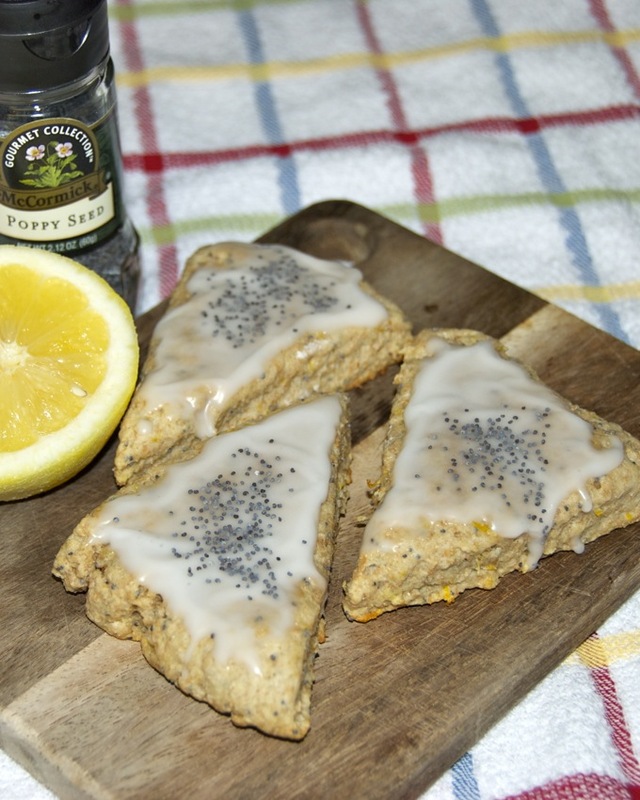 I decided to go with the old standby, but since lemon poppy seed muffins tend to be a little too sweet and cupcakey, I thought I’d try to adapt my Cherry Berry Scone recipe into a lemon poppy seed variety. Preheat oven to 425 degrees. 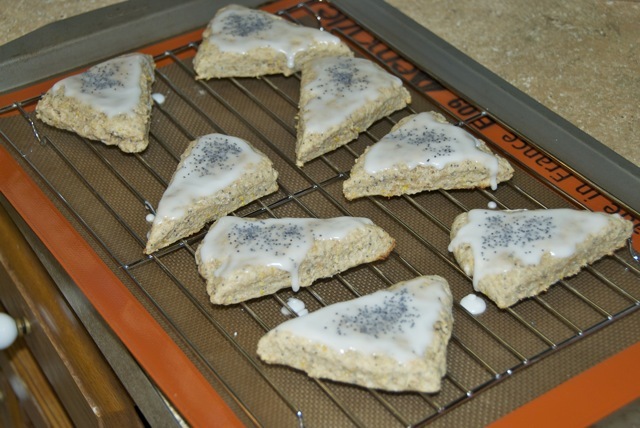 In a large mixing bowl, combine flours, sugars, salt and poppy seeds. In another bowl combine oil, butter, milk, eggs and lemon zest. Add the wet ingredients to the dry ingredients, then add the juice of one lemon (don’t add it directly to the wet ingredients, as it could curdle the milk). Mix well. 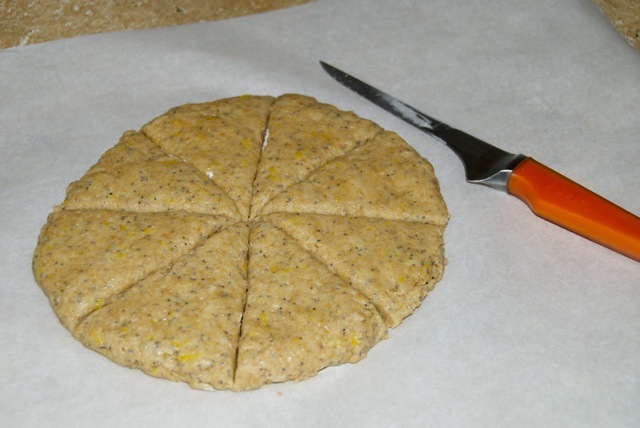 Cut the dough in half and shape each half into a 1/2 inch thick round patty. Score each round into 8 pizza slices with a sharp, flour-coated knife. 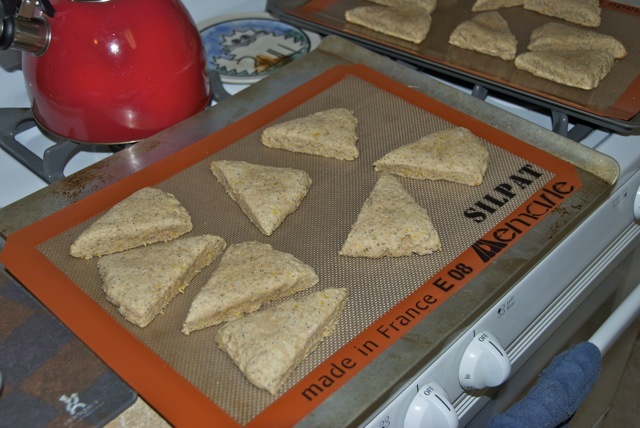 Transfer the scones to 2 parchment lined baking sheets and bake about 12 minutes, until slightly browned on the bottoms. While the scones are cooling, make the icing. Add the juice of the second lemon to the powdered sugar a few drops at a time, stirring, until you reach a drippy consistency. 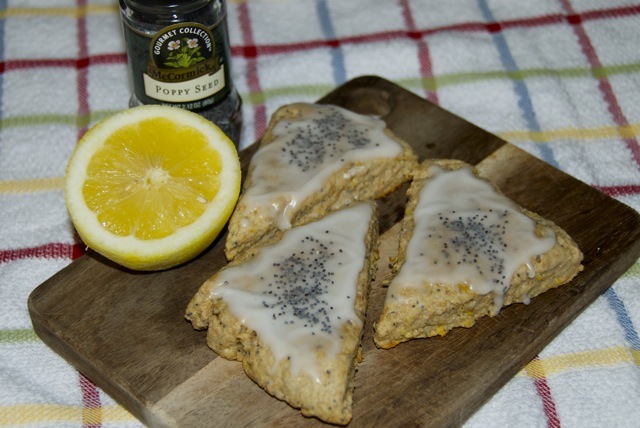 Ice the almost cooled scones with a butter knife, and sprinkle with a few extra poppy seeds, if desired. I wasn’t sure how the whole wheat and citrus would go together, but it actually worked quite nicely. The icing was killer… super sweet and tart and lemony, and it complimented the dense “sconiness” well. I’m licking icing off my fingers right now. 🙂 Thanks, McCormick!